Tyra welcomes the judges to the stage. 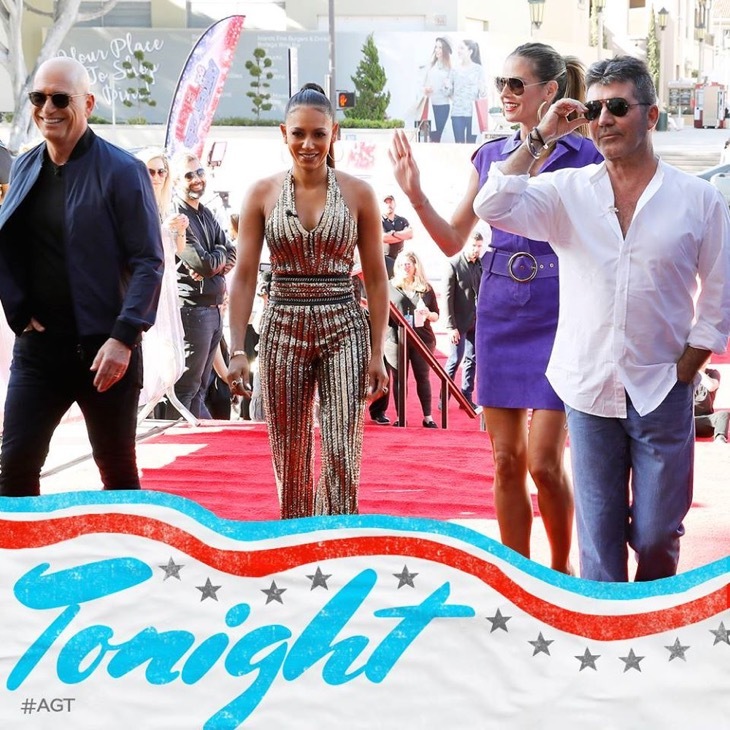 Howie Mandell, Simon Cowell, Mel B and Heidi Klum are excited for the show to begin. Oscar Hernandez is a 34 year old from Arizona and his grandmother is his inspiration. His true passion is performing. He dances to My Anaconda and while his moves are unconventionally the audience loves him. He was very entertaining and all four judges vote YES. Elena and Sasha are a married couple who have a balancing act with a perch pole. He balances the 8 foot pole on his forehead as she spins at the top. Heidi loves it and Simon tells Elena she is nicely stupid. They also get four YES votes from the judges. Shemika Charles takes the stage and performs a limbo dance. Her mother and grandmother are also limbo dancers and view it as part of their culture. She easily goes under a pole that is only one foot off the floor. She does several more amazing tricks and then limbos under a truck. Mel B’s daughter is a huge fan of Shemika and watches her on YouTube. She gets 4 YES votes and moves on to the next round. Kechi is originally from Nigeria but now lives in Houston. She has been singing seriously for 12 years. She was in a plane crash when she was 16 years old. Only 2 people out of 109 passengers survived the crash. Kechi suffered significant burns and has had over 100 surgeries. She used music as an escape from her pain. She gives it everything she has and sings her heart out. She gets a standing ovation and four YES votes from the judges. Howie was blown away and Mel found her to be brave and inspiring. Heidi loved her energy and Simon tells she needs to believe in herself and she has a great future. Big Benji is a 73 year old woman and she has come to bring love and is in love with Simon. Big Benji thinks he pretends to be tough but she says he is juicy inside with love. Her singing is horrible but she does not get buzzed off the stage. Howie thinks she is adorable but votes No. The three other judges also vote NO but Simon comes on stage and gives her a kiss. Heidi then comes on stage and kisses her husband who is 80. Joan is 82 years old and from Oklahoma. She also has a big crush on Simon. Mel buzzes her almost immediately but the other three judges give her a YES vote. Joan thinks Mel is just jealous. Several other older women take the stage and fawn over Simon. Howie just can’t understand why he can’t get any female attention. The next act is the Syncopations, a group of 9 older women who sit in chairs and do a hand jive. They also kick their legs and aren’t wearing underwear. Only Simon votes YES and they will not move on. The next act is magic performed by Tony who is 21 years old and from France. He does several amazing illusions and the judges and audience love him. He gets four YES votes. Howie thinks this is the best season yet. The group, In The Stairwell, an A Capella group of Air Force members take the stage next. Howie buzzes the group and just doesn’t like them. He says he respects their service but found the act boring. The crowd Boos. Mel, Heidi and Simon vote YES and the group moves on. Wyatt Gray is a comedian and gets buzzed and booed immediately. All four judges vote NO but Howie encourages him to keep practicing. Daniel is 23 years old and will be singing for the first time in front of an audience on the show. He imitates Goofy, Kermit the Frog, Scooby-Doo, Simon, Peter from Family Guy, and Mickey Mouse. Howie loved the variety and Daniel gets four YES votes. He will be seen in the next round. The Pomeyo family and their performing dogs take the stage. They are from Florida and perform several tricks with the dogs. They have a total of 18 dogs, most of which are from animal shelters. They hope to earn a show in Vegas. Everyone loved the performance and they get four YES votes. The Dancing Pumpkin Man is the next to perform. He has been dancing for years. He is dressed in black with a Pumpkin face mask. Simon buzzes him immediately but Mel loves it. Howie and Mel vote YES and Simon and Heidi are NO. Mel takes the stage and won’t leave until one of the judges changes their vote. Simon decides to switch to YES and the Dancing Pumpkin Man moves on to the next round. Christian is 16 years old and is a singer. He has been singing for years and sings a Jackson 5 song. He does a great job and Howie hits the Golden Buzzer. Christian moves on the live finals round.